The weather lately has been cold, windy and wet. We all layer ourselves up ready to battle the cold wind on the school run. My son's school is surrounded by fields so we get the full force whilst waiting for school to let them in, Jared normally has a thick coat on and his hat. Eryn on the other has a sleepsuit, hat and blankets. I'm sure many of you aware of the dangers of putting a baby in a car seat with a coat or snow suit on so I won't go into that. Due to the above Eryn doesn't have much other than her blankets to keep her warm which is all good and well but when it is windy it's just not good enough. I'm often putting the blankets back on her because she has kicked them or the wind has blown them. Our blustery school run has just been made more pleasant, well a lot more pleasant for Eryn. The lovely Cocoon Babies sent us one of their car seat blankets to try out. I was so eager to try this and it arrived just in time as a few days after it arrived we had some snow and strong winds. 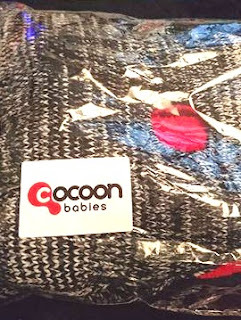 The Cocoon Babies car seat blanket suitable for babies 0-6 months and fits all 3 and 5 prong car seats.. 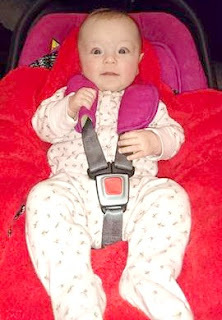 The blanket sits in the car seat and the straps go through the holes, there are velcro straps to the side for those who have 5 pronged seats. To fasten the blanket you just pop the four poppers together, it is so simple and easy. 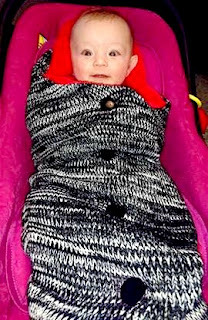 The blanket ticks all the right safety guidelines too which is great and much better then putting baby in a snow suit. I'm not going to lie I have travelled in the car with Eryn whilst she has had a snow suit on because it was just too cold for her. 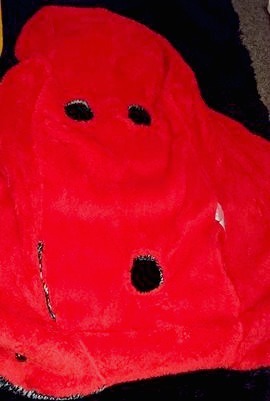 The inside of the blanket is a fleece lining which comes in red, pink and blue and the outer part of the blanket is wool. The whole blanket is soft and Eryn loves holding on to it. She is one of those babies who likes to feel materials and rub them. As mentioned above the blanket has four poppers to fasten it which is also good for when we are in the car because we can leave them open then fasten them when we get out so she will be totally snug, great for ensuring that baby doesn't become over heated. I love taking Eryn out of the blanket and giving her a cuddle because she is so warm and toastie. I have washed the blanket and I very pleased with how well it washed. Sometimes materials can bobble, shrink or lose the softness, I'm happy to say this did none of that at all. I would definitely recommend getting one of these if you will be using your car seat a fair bit. *Disclosure this item was sent to us free of charge for the purpose of the review. This has in no way influenced my thoughts on the product. All opinions expressed are that of my own. All photographs are my own and not available to be used anywhere else without permission.